The misheard: Got a list of Starbucks lovers. The misheard: I said, "You're holding back, "She said, "Shut up that duck with me!" The misheard: reaching out to vote the bus. The misheard: Annie, are you voting? The misheard: Be in the position to make me feel so democratic. "Kiss This Guy"? What does that mean? 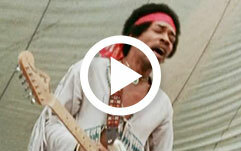 Did Jimi Hendrix really say, "'Scuse me, while I kiss this guy?" We think the video makes it pretty clear that Hendrix liked to mess around with the lyrics, and on occasion actually did say "'Scuse me, while I kiss this guy."